As an educator and presenter, I’m always looking for apps to support these activities. A few weeks ago, I read about an app called Conference Pad which takes a different approach to sharing PDF files with groups small or large. Conference Pad ($4.99) allows you to simultaneously present a PDF file to other iPads, iPhones or iPod touch devices using Wi-Fi or Bluetooth. The controlling device – an iPhone, iPod Touch, or iPad – allows any number of other devices to connect to it while it displays a PDF on its own screen and any connected display. 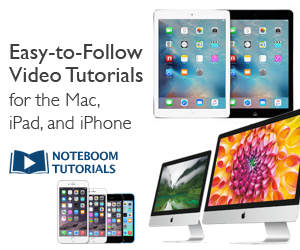 When you change pages, zoom or pan on the controlling device, all other devices nearly instantly follow along. I contacted the author, Evan Shoenberg, M.D., and he graciously provided me a review copy. 1. The PDF you wish to display must be transferred to the controlling iOS device. For example, if you are using an iPhone to control one or more iPads, transfer the PDF to your iPhone. 2. Conference Pad can use Wi-Fi or Bluetooth to communicate between devices. You’ll want to use all Wi-Fi or all Bluetooth. Wi-Fi is significantly faster, so it’s preferred if you have access to a network. 3. Load Conference Pad on each device. 4. On each device which will be used for display only, select the controlling device’s name in the ‘Choose a device’ list. A checkmark will appear next to its name. 5. Begin the presentation on your controlling device. It will be automatically transferred to each display device, if that device doesn’t already have it stored. As noted above, this may take a few minutes, depending on your presentation’s size and your network speed (Wi-Fi is much faster). Once it’s been transferred once, it is stored, so it’s optimal to take this step the first time before your audience is waiting – that way, when you start the presentation again, you’ll be up and running in seconds. 6. On the controlling device, tap or swipe left to go to the next slide. Swipe right to return to the previous slide. Tap and hold to show the laser pointer, which will also display on all connected devices. Pinch to zoom in and out; this, too, will be reflected on other devices, and you can then pan around the slide. Each device must have Conference Pad installed. There is no free “reader” or “reception app” for just receiving the shared display. However, the app is a universal binary so you can install a single copy on all your iDevices. To test Conference Pad, I installed the app using one licensed copy on three devices – my iPad (iOS 4.2.1), a first generation iPod touch (iOS 3.1.3) and a third generation iPod touch (iOS 4.2.1). I tested at home over an 802.11g network and using Bluetooth. My slide show had 28 slides, many with builds and several with charts. Note that transitions, animations and videos will not be displayed. However, builds work just fine. Each slide with builds is converted to a series of slides, each containing the next step in the build sequence. The app interface on the iPad is different from the iPhone/iPod touch. The iPad’s screen can include more information up front, so helpful directions are more obvious on the iPad. However, the smaller iDevices do include directions behind the now familiar information icon (i). Tapping this icon brings up the same step-by-step guide found on the website. Curiously, direct access to this guide is missing from the iPad version. No matter what device you are using, Presentation to Control (iPad) or Control (iPhone/iPod touch) means the device runs the PDF file. All other devices will Display that presentation PDF. On the iPad, you tap the file name to see the first slide and then tap that slide to begin sharing. Or simply double tap the file name to begin. On the smaller iDevices, just tap the file name once to start. I can confirm success with both WiFi and Bluetooth. WiFi worked well in my home across the three test devices, including one at a distance of approximately 15 meters and through two walls. Bluetooth with two devices (the oldest iPod touch has no Bluetooth) also worked well at a similar distance. The greater the number of devices sharing the presentation, the longer it takes to make them ready. Naturally, Bluetooth took longer to get ready to present the file. The first time Bluetooth took nearly 30 seconds for the iPod touch to recognize the show playing on the iPad, that is, to transfer the slide show. However, the next time I ran the same slideshow over Bluetooth, the presentation was ready to go almost immediately. Once the show began, slide changes were quick. Zooming, pinching and moving the slide while zoomed all worked, though there was a hint of lag as the display devices responded. It took a second or two for connected devices to resolve the zoomed image. This is expected when you consider the display magic that’s happening here, especially across different size screens. The red virtual laser pointer (activated by touching and holding on the screen) was fine for directing attention to items on the iPad screen but covered too much of the content on the smaller screens. The author recommends WiFi over Bluetooth and I agree. There were a few instances where the slide change didn’t happen in Bluetooth, though moving on to the next slide did cause the display devices to catch up. However, the addition of Bluetooth greatly enhances the usefulness of Conference Pad. For example, many WiFi networks require a login of some kind. With Bluetooth there is no setup or the typical Bluetooth pairing needed. The Conference Pad app simply recognizes Bluetooth devices within range. Here’s another example where Bluetooth may come in handy. I also attempted to use Conference Pad in a classroom at a local university. I decided to try a WiFi connection first, but quickly realized that in addition to the step of logging on to the wireless network, I could only use one device at a time with the same credentials. So, I couldn’t test with WiFi there due to the multiple login restriction. However, Bluetooth would have worked for me with my multiple devices. Having the choice of two wireless protocols is a good option. When using an iPad as a display for a presentation controlled by another device, connect to the controlling device before beginning the presentation. In my experience, this was the most reliable approach. Remember to turn Bluetooth off when you’re finished to save battery life and to prevent other devices (and others) from discovering your device via a bluetooth connection. You can also connect the control device to an external monitor or projector to show the presentation on a bigger screen. For example, I connected my iPad to a large screen monitor, started the show on the iPad and controlled it remotely from my iPod touch. This is a feat you cannot yet do with Apple’s own Keynote presentation app for the iPad (though I suspect we’ll see Apple include that capability soon). Apple does offer the Keynote Remote app (WiFi only) for controlling a Keynote show running on your Mac but not on the iPad. Though the primary purpose of this app is to display presentations, you can display other PDF files. I tried a book and two articles in PDF format. All worked fine, though considerable zooming and panning was needed due to the smaller font sizes of the content. Any file you want to use with Conference Pad must be in the PDF format. The support website has a detailed document for Mac OS X and for Windows on how to transfer files into Conference Pad. 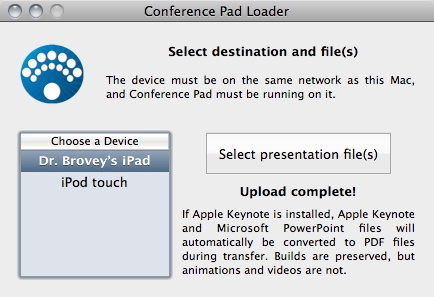 You can load PDFs via USB through iTunes or wirelessly with the Conference Pad Loader program (Mac OS X only). This computer program (the loader) and the iPad app are two different applications. The Conference Pad Loader program will automatically convert Keynote or PowerPoint files on your Mac to PDFs and send them to Conference Pad. Note that your Mac must have Apple Keynote installed for the loader program to work. The directions tell us “Keynote will automatically launch, convert the file(s) under Conference Pad Loader’s control, and quit.” The Keynote program on my MacBook Pro didn’t quit when finished. Instead, I got the following dialogue box. Not a flaw and no big deal, just different from the directions. I suspect a minor hiccup in what appears to be some sort of Automator script. The wireless transformation happened quickly and I enjoyed watching the converted files automatically appear on the target device. Overall, I experienced few glitches during my time with Conference Pad and I plan to continue assessing its potential with greater numbers of devices and in other venues. A less expensive “reception only” app would be a welcome choice, especially for schools. Adding the user guide to the iPad edition should be an easy fix. 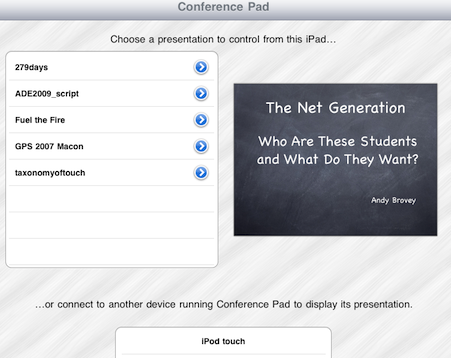 The Conference Pad website offers a list of features and multiple suggestions where the app may be useful. Dr. Shoenberg’s company, Regular Rate and Rhythm, also offers a number of other apps including a remote control app, a magnifier app for small screens and several for the field of medicine. When you visit his website give Conference Pad a look. You may find the features a good fit for your next presentation.